Also serving communities of Wallingford, Castleton. There are 9 Assisted Living Facilities in the Rutland area, with 7 in Rutland and 2 nearby. To help you with your search, browse the 2 reviews below for assisted living facilities in Rutland. On average, consumers rate assisted living in Rutland 5.0 out of 5 stars. Caring.com has helped thousands of families find high-quality senior care. To speak with one of our Family Advisors about assisted living options and costs in Rutland, call (855) 863-8283. In the early 1800s, the city of Rutland, VT, got a boost from the discovery of really high-quality marble in the hills outside of town. The mines closed in the 1990s, but today the city is still big enough to host 15 assisted living communities for local seniors. These facilities are regulated by the Vermont Division of Licensing and Protection, which publishes guidelines and conducts inspections to ensure a high quality of care for aging citizens who need help with activities of daily living (ADLs). Rutland's weather is typical of New England, with single digit temperatures in winter to around 80 degrees Fahrenheit in summer. Rutland gets 45 inches of rain a year, mostly in summer, when high pollen counts can aggravate seniors' asthma. A regular 74 inches of snow can also create cold, dry conditions seniors with COPD might have issues with. Rutland has a relatively low cost of living in most areas, but some key expenses that affect seniors most tend to be higher than the prices paid nationwide. Groceries in Rutland can run to 5 percent higher cost than the national average, while the cost of health care is sometimes up to 14 percent higher. Vermont charges an effective tax rate on income that runs from 3.55 to 8.95 percent. SSI and most forms of retirement income are exempt, however, so seniors can mostly get by without the expense. Crime in Rutland has fallen over the years. It is now just a bit less than the typical national rates in most categories. Violent crime has always been rare here, though rates of property crime are still slightly higher than average for the nation. The Marble Valley Regional Transit District is just called "the Bus" by locals, and it carries passengers on a single regular route around the center of town. Seniors and riders with disabilities qualify for half off the regular fare, but they must present valid transit IDs at the time of payment. The Rutland area is home to world-class medical facilities, including Rutland Regional Medical Center, in the event of medical emergencies or illness. Assisted Living costs in Rutland start around $0 per month on average, while the nationwide average cost of assisted living is $4,000 per month, according to the latest figures from Genworth’s Cost of Care Survey. It’s important to note that assisted living rates in Rutland and the surrounding suburbs can vary widely based on factors such as location, the level of care needed, apartment size and the types of amenities offered at each community. 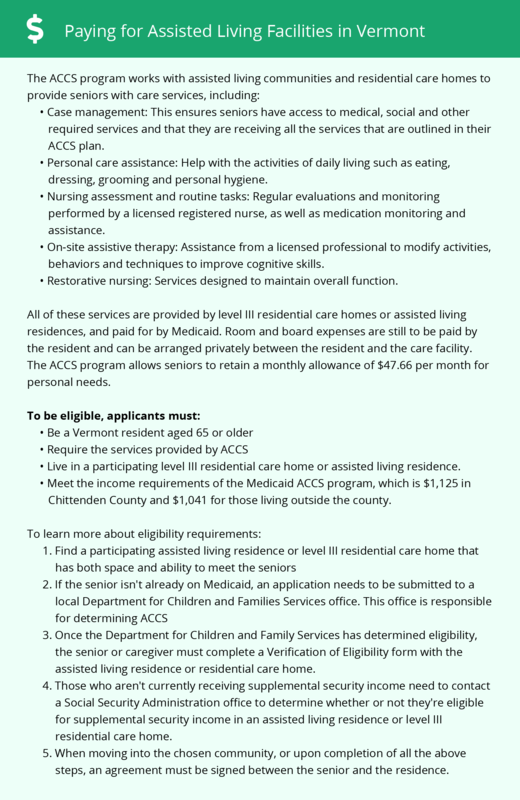 Vermont seniors who are currently enrolled in Medicaid may qualify for the Assistive Community Care Services (ACCS) program, which helps low- and no-income seniors cover the cost of assisted living. Learn more about these programs, plus who’s eligible, on our Assisted Living in Vermont page. For more information about different ways to finance assisted living, visit our Assisted Living in Vermont page. Rutland and the surrounding area are home to numerous government agencies and non-profit organizations offering help for seniors searching for or currently residing in an assisted living community. These organizations can also provide assistance in a number of other eldercare services such as geriatric care management, elder law advice, estate planning, finding home care and health and wellness programs. To see a list of free assisted living resources in Rutland, please visit our Assisted Living in Vermont page. Rutland-area assisted living communities must adhere to the comprehensive set of state laws and regulations that all assisted living communities in Vermont are required to follow. Visit our Assisted Living in Vermont page for more information about these laws.